When I visited a grower today in the Murphy, NC area, I saw that the buds on his vines (Norton, Seyval) are just starting to swell. That is a good sign, given the cold weather we had this week and what is predicted for later next week. Unfortunately many varieties are much further along, especially in the eastern parts of the state. Now starts the time to hope that not another cold event will come and possibly lead to injury of the vines. •Air Temperature around 32F, plant surface temperatures can be lower! •First freeze in NC: April7-8, 2007 Can be devastating. Cold wind can damage plants even in dormancy. Can stay several days. •Usually no long events Can be devastating. Cold wind can damage plants even in dormancy. Can stay several days. The good news: For the next few days, we should be on the safe site. But colder temperature are expected for second half of next week. This might of course change. Figure 1: Predicted MIN Temperatures for NC from Firday (3/16) – Thursday (3/22). With predicted warmer temperatures for the weekend and the first half of the week, the chance of rain will increase as well. Figure 2: Rain possibility prediction for the from Friday (3/16) – Wednesday (3/21). It is important to monitor the temperatures on bud-level on your site. As always, I hope that helps. 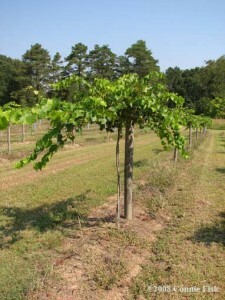 North Carolina’s muscadine grape industry is growing. This site was developed to bring together the latest information from the Research and Extension Specialists at NC State University for muscadine growers throughout the state. For more information about the Specialists and their programs please visit the Resources page. For more information about North Carolina’s muscadine industry please visit the website of the NC Department of Agriculture & Consumer Services.